The Forbidden Kingdom – Trails, Culture and Mind Blowing Views. 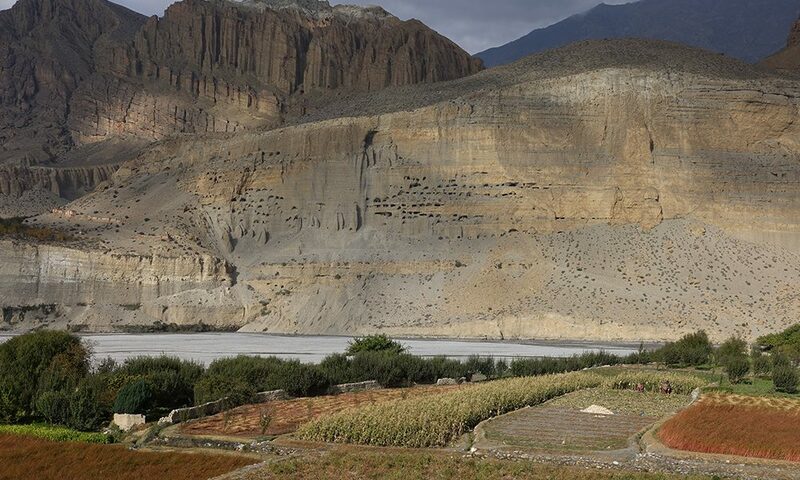 Upper Mustang is fast becoming one of the most popular trips we run. This ride has so much to offer in the way of trails, uphill challenges and endless downhills. But there is more here than just biking! This remote, almost desert like places is home to a unique people and culture. Life is hard here, but these hardy people somehow survive. Not only that, the people are among the most welcoming on earth. 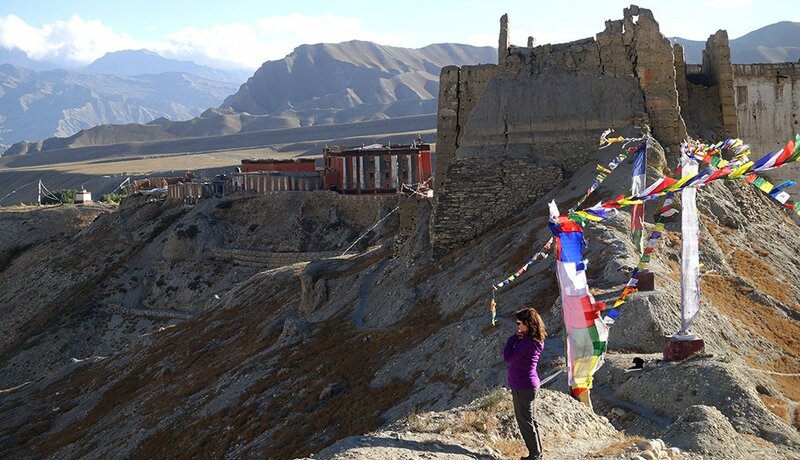 Everyone that travels to Upper Mustang comes back with a lifetime of unforgettable memories. 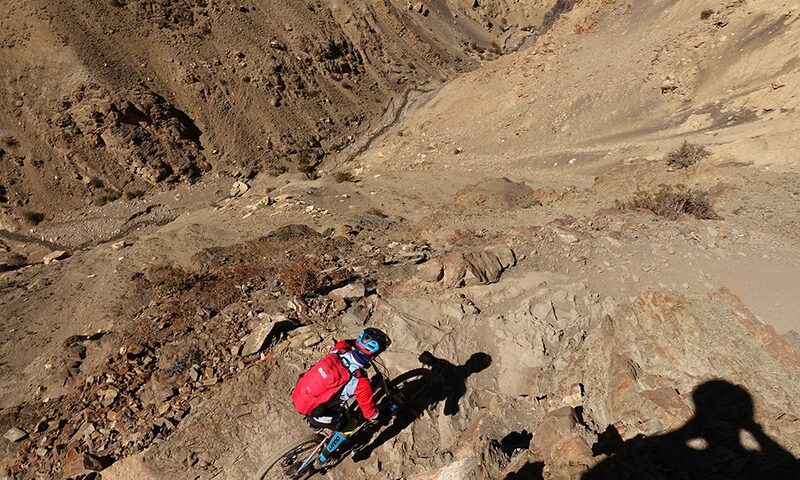 Here is our photo story from Upper Mustang. Photos By – Santosh Rai and Makato Ishibe. 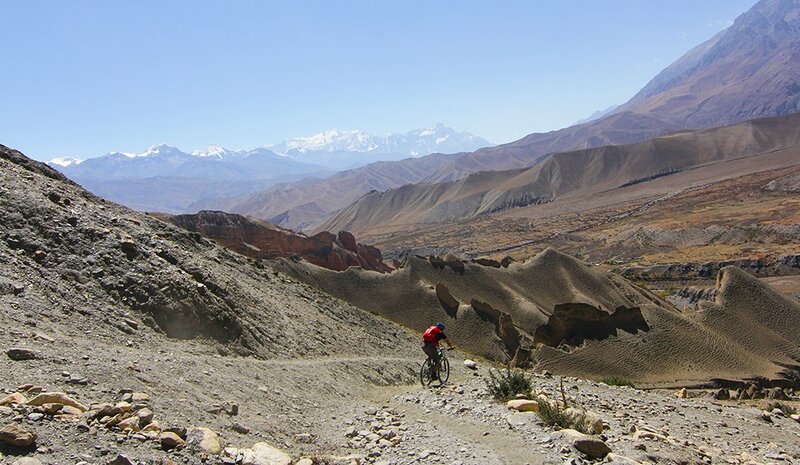 The Biking trails in Upper Mustang are second to none, everyday present new and exciting psychical and technical challenges. Here in the background of this picture you can see a small aqueduct and pond, this is the life blood of the region. Water for life, crops and animals. Some of the Single Tracks here are just breathtaking in more ways than one. Here a local woman makes an additional income from working her loom. 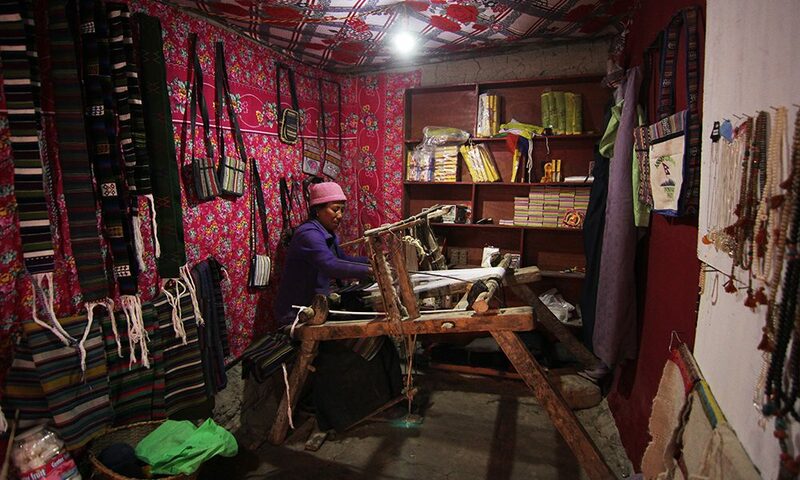 She is making traditional blankets, aprons and scarves fro local yak and goat wool. This same technique has been used for centuries. She probably learned from her mother, who in turn learned from her mother. 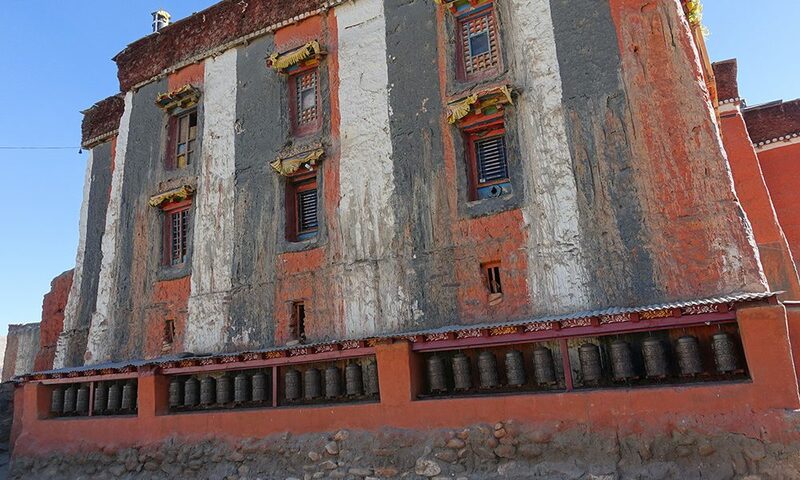 Changra and Yak skulls are found on the on the outside of houses to ward off demon spirits. In ancient times, the first people to live in Mustang, lived in caves. You can see along the ride many caves dug into the cliff faces. Later some of these caves become holy places and were turned into monasteries. One such place you can visit here on a day trip to Ghom, outside of Lo Mantang. The landscape here is so big and empty, it is easy to feel small. 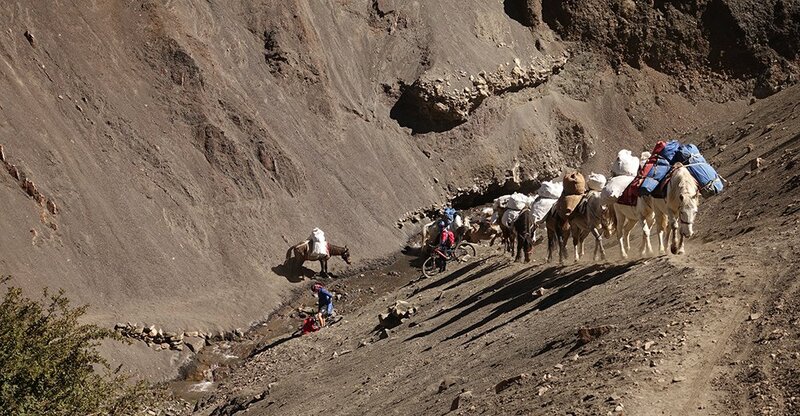 Riding in Upper Mustang gives you a surreal experience. ‘Changra’, mountain goats, are another very important animal in the region. Herders take them all through the spring and summer into the high pastures to grazes. 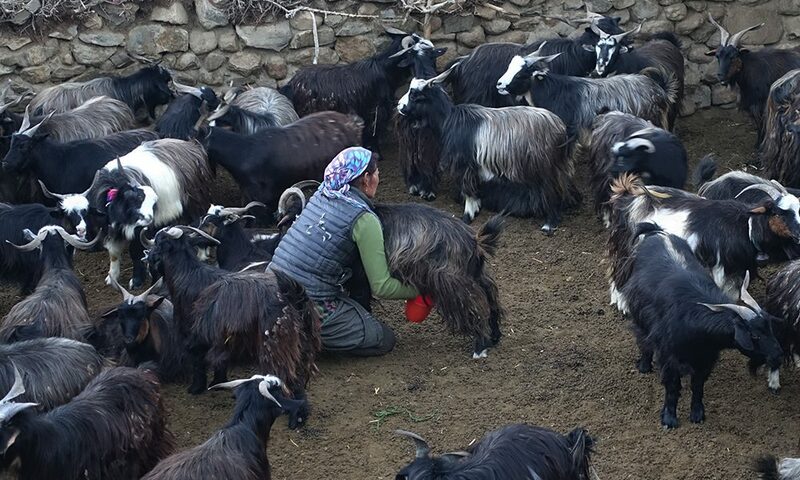 Locals rely on their wool and milk to survive. Also the meat is more used that Yak. During the festival time of Dashian in October, these animals are sold for up to $300 in the cities. This represents a substantial income for the local people. 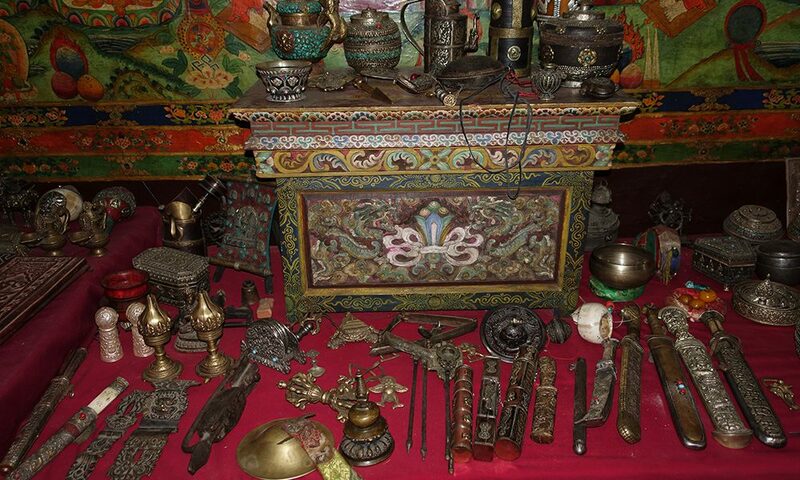 Antiques are easy to find in the region due its is rich history. One can spend hours and hours looking around the bazaar’s for lost treasures. Along the trails, you will find stone walled Apple Orchids. It’s surprising in this arid landscape, yet somehow Apples seems to thrive here. 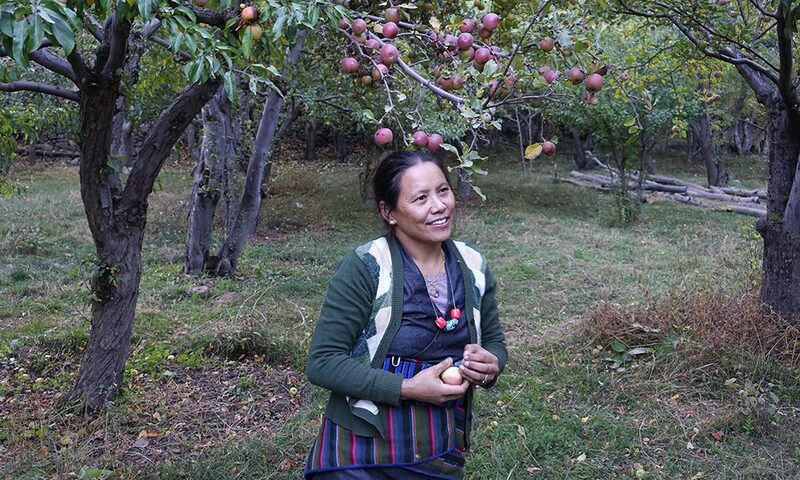 Some regions in Upper Mustang are very famous for there apples. They are sold fresh, dried and also fermented into Apple Brandy. 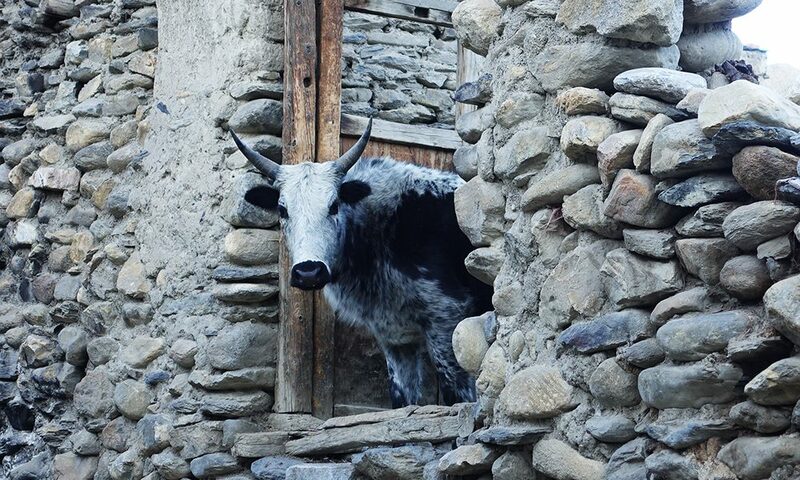 This cross breed between cow and Yak is very popular in the region. It gives better milk. There are many snow fed streams in the area which join the main Kaligandaki River. Sometimes, crossing them can be tricky. One of the highlights of any trip into the region is to witness a festival. 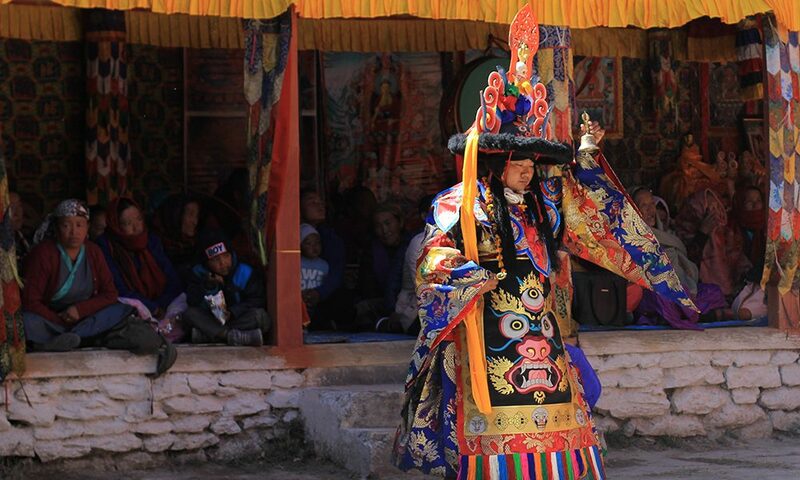 The vibrancy and enthusiasm around these festivals is a steak contrast the hard life of the people that live in Mustang. The nature of the landscape means that one must cross many passes everyday to get to the destination. Each pass is marked with prayer flags. Each flap of each flag with the wind sends a prayer to the gods above. There are not many people that come to Nepal and don’t fall in love with the beautiful people. 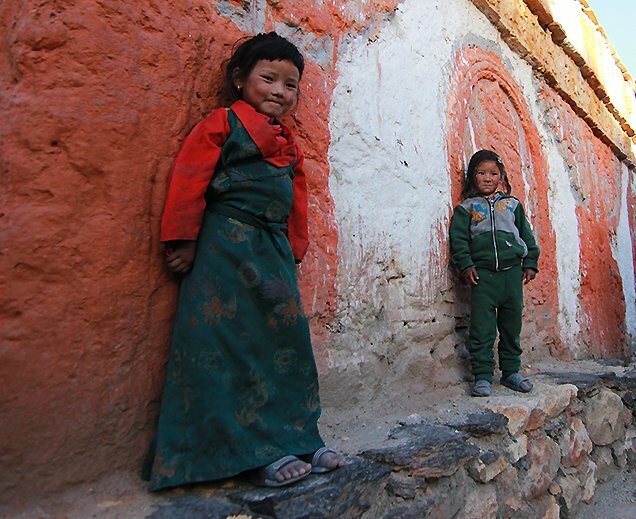 Here are some girls posing in front of a Monastery in Lo-Mantang. Amidst the arid landscape, the rider will found eye pleasing pockets of green, walled apple orchids and glimmering waterways. Kagbeni is the gateway to Upper Mustang. It is nestled on the banks of the upper reaches of the Kaligandaki River. The village is surrounded by fields full of barley, potatoes and millet, the staple diet of the people of the region. 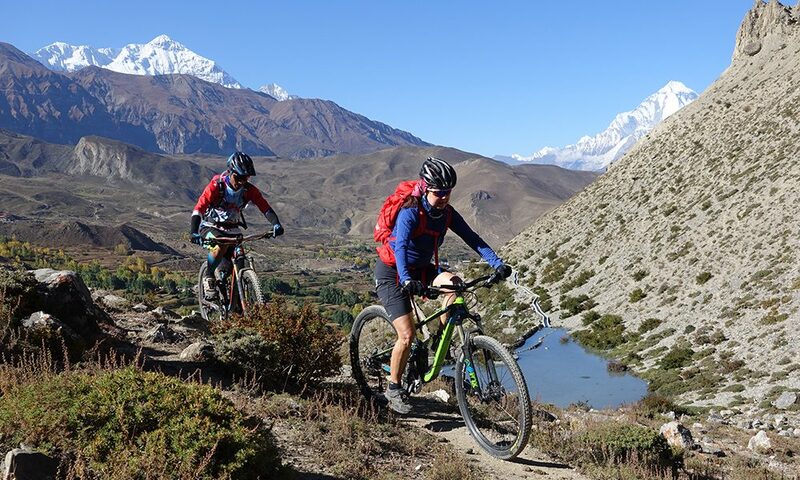 Many of our clients ask us how we transfer their luggage during our mountain bike trips. Here is the awesome, it gets transported on ponies and mules. These animals where once he life vein of the region. Though now they are slowly being replaced by vehicles. This is the ancient library in Charang. It is located near the princess palace. Though it is now unused it is a site worth visiting. There are not shortage of places to loose yourself in thought and meditation. Yaks are precious in this region. They have many purpose as beast of burden, provides of milk, wool and dung for fires. 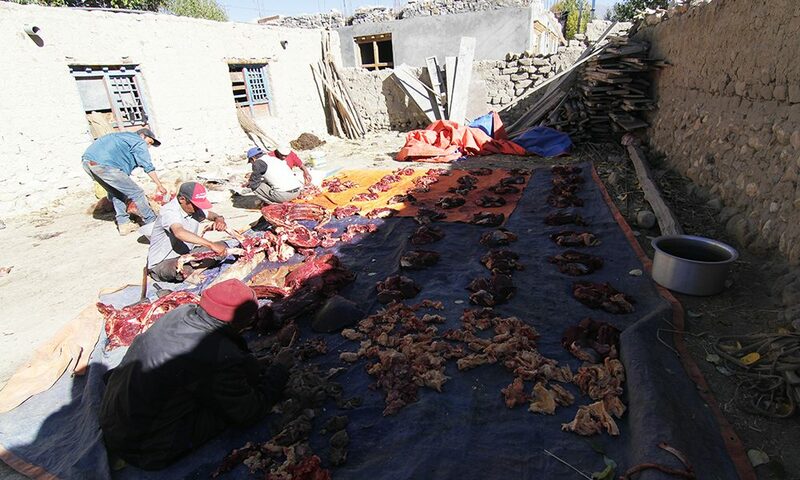 Finally when it is time to end the life, the Yak is divided among the villages. The meat is dried and used sparingly on special occasions.